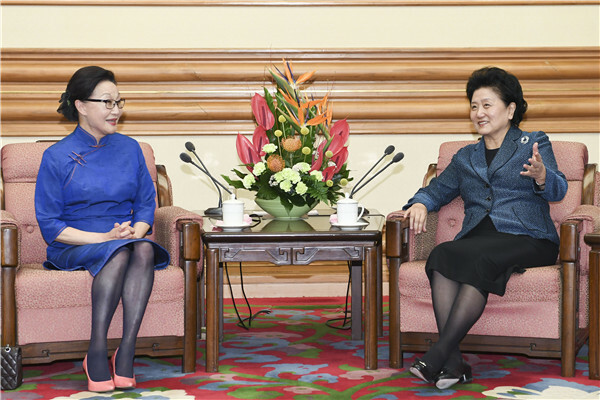 Vice-Premier Liu Yandong met with a delegation headed by Florence Fang, honorary trustee of Peking University and well-known Chinese-American leader, on March 28 in Beijing. Sino-American high-level people-to-people cultural exchanges have witnessed many developments since the mechanism was established seven years ago, said Liu during the meeting. The two nations have carried out high-level cooperation in fields including science, education and arts, and hundreds of tasks were accomplished. Such efforts have laid a solid public foundation for the development of bilateral ties, according to the vice-premier. Liu commended Fang’s efforts in supporting and promoting Sino-American friendship and people-to-people exchanges and encouraged her to contribute more to enhance understanding between the two nations.